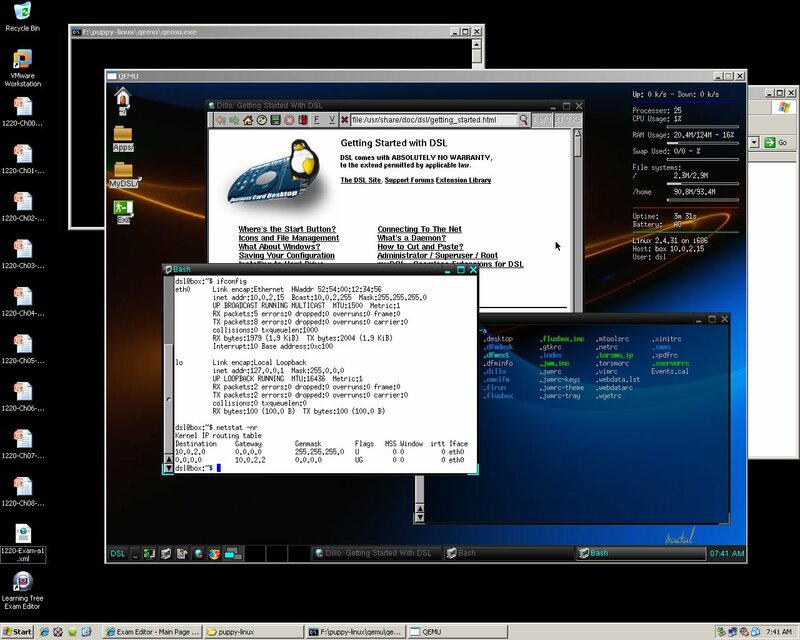 This lets you run Linux within a window on a hosting machine running Linux or BSD or Windows. No need to carry a bulky and expensive laptop. Just plug your USB thumbdrive into a host computer and start your own person machine running within a window there. You do not reboot the host machine — your Linux system runs as an application on its graphical desktop. It finds and uses the network connections, and acts like a full (although somewhat slow) Linux system! See the page that explains how to do this with Puppy Linux: http://www.erikveen.dds.nl/qemupuppy/index.html. That very likely tells you everything you want. However, for suggestions of which further steps are especially useful, and how to do this with a different distribution, keep reading this page. Notice that you can do all the initial work directly on your native Linux system! Extract the files into a directory and get things running there. No need to write the files to your USB drive until you have things set up the way you want them. See my explanation of how to set up SSH user keys. This will let you easily pull in all your personal information, and easily upload it again. As the QEMU/Puppy page explains, FTP can be tricky in the QEMU environment. But SSH works just fine! $ scp -pr nativelinux:.ssh . But if you haven't done this yet, see my explanation. Resizing the filesystem on pup_save.3fs to 524288 (1k) blocks. The filesystem on pup_save.3fs is now 524288 blocks long. I decided to try this with DSL Linux instead of Puppy. Start by downloading its embedded version. Also download the QEMU/Puppy embedded file. The problem is that the embedded DSL version only includes QEMU for Windows! Yes, that's generally what you want when you're in some cybercafe, but it's not very useful for testing in your environment where you have nothing but UNIX machines. Extract the two archives. Be careful, don't make a mess of the files! You want to have two subdirectories, one with each embedded distribution. Modify the UNIX QEMU script puppy.sh by changing the last line to the following. Note that I have broken the lines for display here, be very careful if you do that instead of simplying changing the one long line. If you know the Linux machine will have more memory, then change that 128 to a larger number. But make sure that it is no larger than half the physical RAM on the host system! I eventually decided that I preferred Puppy Linux over DSL, once I replaced its more and vi and made other adjustments. Below are some screen shots of DSL Linux running inside QEMU on a 64-bit Windows XP desktop. The screen shots are at 50% of original resolution, click on them for full-sized versions. DSL Linux running inside QEMU on a Windows XP desktop. Firefox on DSL Linux running inside QEMU on a Windows XP desktop. Also see pendrivelinux.com for a way to run Linux from a USB device, either rebooting the hardware or, more elegantly, running it under Windows with QEMU. Can you run Windows 8 inside QEMU on OpenBSD? Apparently! I haven't done it, but here's a video by someone who did.